Cupcake, my love: Heavenly Goo! 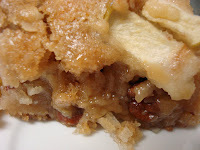 I am a huge fan of Dorie's Blondie recipe, in her book Baking From My Home to Yours. 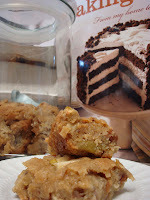 But I wanted to put a new spin on it and see if I could create my own special blondie recipe, and Bloggers, I did it! 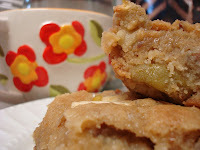 My recipe is a Caramel Apple Pecan Blondie, and it will knock your socks off! I am a caramel apple addict and have been craving something caramely for a while, so I figured I'd give my theory a whirl. 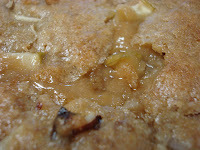 I must say that I was getting a little nervous when I was pouring the caramel into the batter, because I was so afraid that it wasn't going to work and that I was gonna have this awful glob of dough...but NO! My caramel beat in perfectly with the butter and brown sugar. After I had the dry ingredients mixed in, I folded my chopped Granny Smith Apple and the pecans. Let me tell you guys, this was probably the best dough I HAVE EVER had! I could not put my spoon down, so that gave me much hope that my blondies were going to turn out great. Hi! Just stopping by to say hi to all of the new TWD members being that I am one myself;) I love your blog and I look forward to sharing in your many dessert adventures. these look TASTY...i love me some brownies. i love your blog, super cute and fab pictures!! !